As always, SuccessConnect Berlin 2018 was packed with announcements and new product features, especially in the area of analytics and reporting. One day before the event, there were several Preconference Product Advisory Panels, giving customers the opportunity to engage with Product Management. Register for the Customer Empowerment Events Newsletter and always receive the invite right in your inbox. The conference itself was kicked-off by Greg Tomb, President of SAP SuccessFactors speaking about the way intelligence will transform the economy and the (working) world. 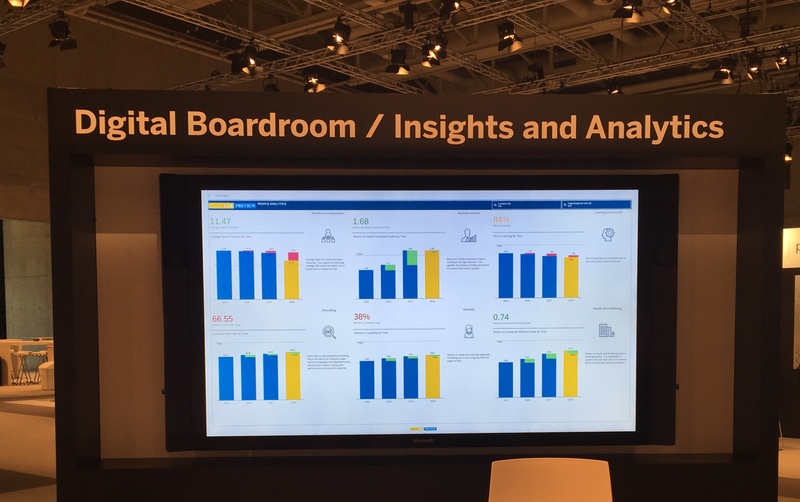 Amy Wilson, Senior Vice President, Product, at SAP SuccessFactors, demonstrated the latest features in SAP SuccessFactors using smart assistants and also giving a preview of how analytics and reporting will transform using SAP Analytics Cloud. If you missed the keynote, you can still register and watch the replay here. Details were shared during the roadmap sessions on reporting and analytics capabilities (of course, all forward looking statements may be subject to change). 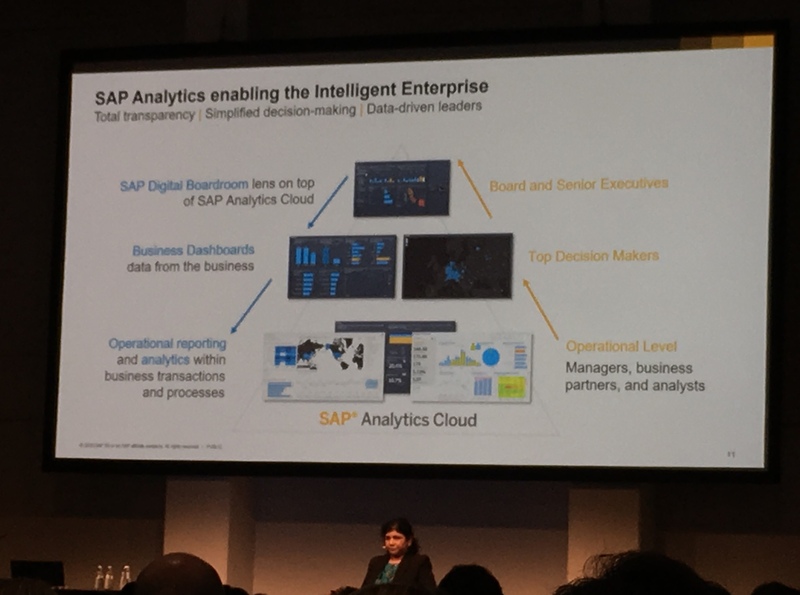 For reporting, Yamini Polisetty and Robert Wood emphasized that SAP Analytics Cloud is the strategic tool which is planned to initially run side-by-side with the existing Online Report Designer. The aim, however, is to ultimately make SAP Analytics Cloud the sole query and visualization tool in SAP SuccessFactors. Customers will benefit from a beautiful self-service user experience based on a unification of data models and technology which will enable them to tell compelling stories using a single solution. In the short term, early collaborations will start before the product becomes generally available. Future vision shows that this is just the beginning, and along the way functionality is planned to be enhanced using machine learning, alerts and notifications. Yamini Polisetti presenting the Roadmap for Unified Reporting. Confirming the vision to consolidate reporting and analytics tools, the roadmap session for analytics, held by Michael Raich and Kim Fischer lined out a similar path. In the future, users will have the same user experience in SAP Analytics Cloud for people analytics which will eventually replace SAP Workforce Analytics. The difference here is that there is additional functionality planned to be included, e.g. not limiting the data sources to HR data. The roadmap indicates that in the mid term, there is a beta release planned and in the long term it will become the single go-forward analytical solution for SAP SuccessFactors with exciting features ahead, such as data blending and predictive analytics. In the area of SAP Workforce Planning, Søren Højby and Thomas Delaloy presented in their roadmap session a glimpse into the planning content which is currently being developed by SAP. 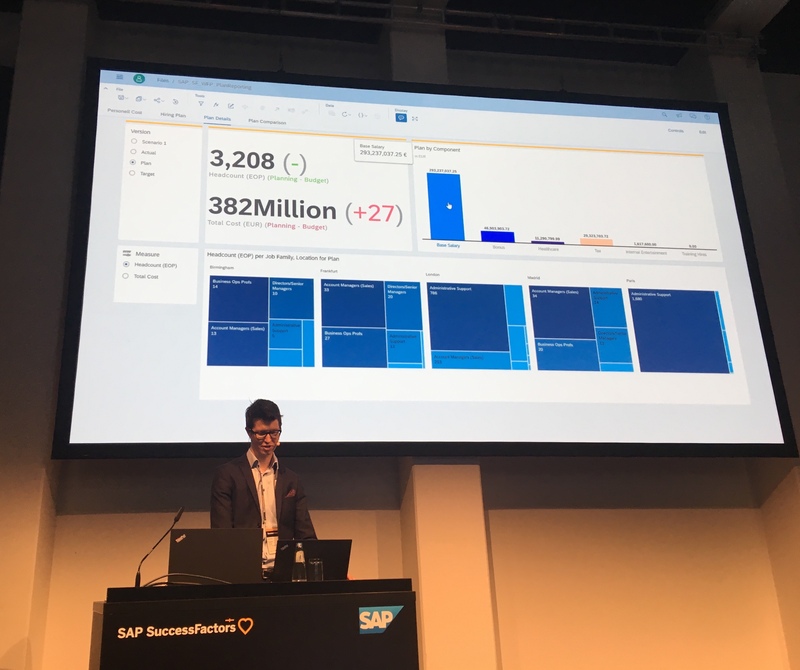 By bringing in data from SAP Workforce Analytics to SAP Analytics Cloud, they built a powerful and easy to use planning application. Here as well, SAP fully relies on SAP Analytics Cloud which as of today already has a broad functionality, such as version management. All cards on SAP Analytics Cloud, you will slowly notice how it finds its way into all applications, giving you the chance to completely modernize your reporting and analytics processes. SAP Analytics Cloud is already available today as a product and if you are curious to try it out, you can get started by using one of the many ways to import your data from CSV, SAP SuccessFactors or SAP Workforce Analytics.